A taste of gold last year for Team Canada at the U19 level has the U18 team this year hungry and on the hunt. For the first time in history the FIBA Americas are being hosted on Canadian soil in St. Catharines, Ontario at the Meridian Centre. Canada has a chance to take it all at home and make history yet again. Canada has climbed to the number 2 ranked country in the world by FIBA. There’s no shortage of talent on Canada’s U18 roster, neither is this the case for Team USA. We’re not as familiar with the latin rosters from below the equator. Some of the rosters have yet to be released; perhaps as a tactic, or leverage point so they are not researched. Nonetheless, Argentina is up there in World ranks at number 8 and always comes to competition well studied and fundamentally sound. Argentina will be Canada’s first opponent, opening up the U18 FIBA Americas competition at 2:15 pm tomorrow. Canada will then go on to play Ecuador and Chile in group play. The coaching staff for team Canada is extremely well put together and covers all ground from Xs and Os to personalities and ego management. Coach Dave Smart has asked them to check their egos at the door and ask themselves, what’s their why? This particular age group is at an important stage in their careers. They have a lot of media attention coming their away and recruitment heating up. Even with all the attention, this group is prepared to play for all the right reasons. Team Captain, Andrew Nembhard, weighed in today on the culture surrounding the team. 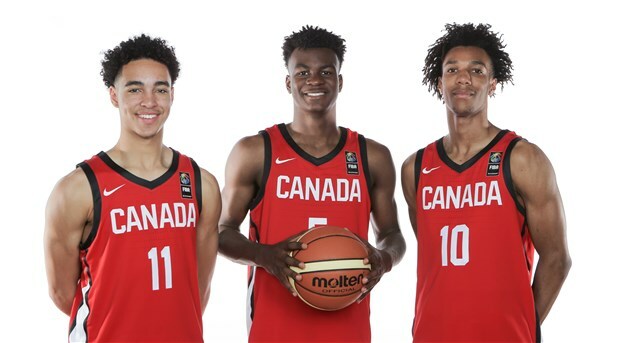 If there is an ounce of selfishness within this team things will crumble when they meet the U. S.
With Nembhard as lead guard and some spectacular secondary and back up help, the guard position is in a good place. After practice today, Addison Patterson, 2020’s top prospect chimed in on where the team’s head is at. Patterson and AJ Lawson will be potent scoring options from the wing. The sentiments were echoed across the board. Lawson, is getting ready to make a college decision for the 2018-2019 season but right now its strictly National team business. It all sounds great, but if this team can walk the walk, we’ll be looking at Canada in the finals against likely the U. S on June 16. All games for 2018 FIBA Americas will be played at the Meridian Centre in St. Catherines, Ontario between June 10 – June 16. NPH will have you covered all tournament! Andrew Nembhard – Muon Reath MIC’d UP! Canada Topflight Academy Capture 2018 NPA National Championship!